Everyone's into this whole travel retail BS. That's where the big bucks are I suppose. Ignorant travelers with fat wallets who will buy anything that's sitting on a well lit shelf. Usually surrounded by ill-informed staff who are hell bent on selling you what ever it is that makes them the most commission. And it seems like most distilleries are quite happy to package their mediocre NAS spirit and sell it at a lovely profit. I won't give you any examples - you know very well what I'm talking about. So when Laphroaig decided to do a Travel Retail exclusive I was quite curious even though I'm not a fan of this marketing gimmick, as you must have guessed by now. The PX was the first. Quite nice, I must admit. The QA was next. Quite dreadful, actually. Which left the third and final installment in this lineup wide open. Was it going to be worse than the QA or better than the PX? Well, it was not only better than the PX it knocked it's socks right off. This is a beautifully crafted spirit. Put together from some of the finest first-fill 18 year old bourbon barrels the spirit was then re-casked in European Oak for a period of time. The result is an exquisitely textured malt which is quite delicious. Nose: Quite sweet, mandarin sweet. Raisins and black currant. Followed by eucalyptus. 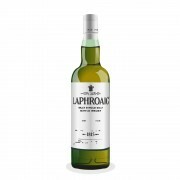 The 18 year old maturity starts coming through next on the back of leather and peaty almonds. Finished off with a musky, iodine nutmeg. Lovely. Palate: Subtle peat and smokey black pepper on chocolate burnt orange. All smeared on an oaky brown bread sandwich. Finish: That all to familiar iodine with traces of chocolate. This is by no means simply a marketing gimmick. This is the real deal. @MaltActivist thanks for the interesting review. You've sold a bottle on your notes! I agree on your Travel Retail / NAS statement. I had the pleasure of sampling this one a week ago and absolutely agree. Nice review. Thanks for reading the review. This is quite a spectacular dram. A return to form, I hope.